Issue opens with Colossus having a flashback to when he was a kid. Except that Kurt is there and Colossus is looking for his sister. Kurt hints that the Inhumans and Cyclops are ruining the mutant race. Colossus wakes from that dream state, into a nightmare. His precious sister is in one of those Inhumanity eggs. Colossus gets terrified by the sight of an Inhuman-induced Illyana. Luckily, she is still in her original form. Well, her form since Belasco changed her course. Colossus finally gets out of all of these dreams. 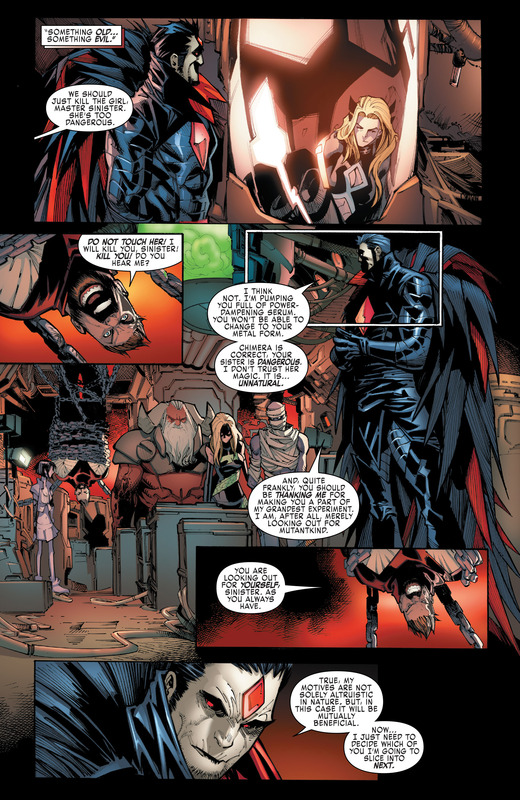 He’s hanging upside down in Mister Sinister’s lair. 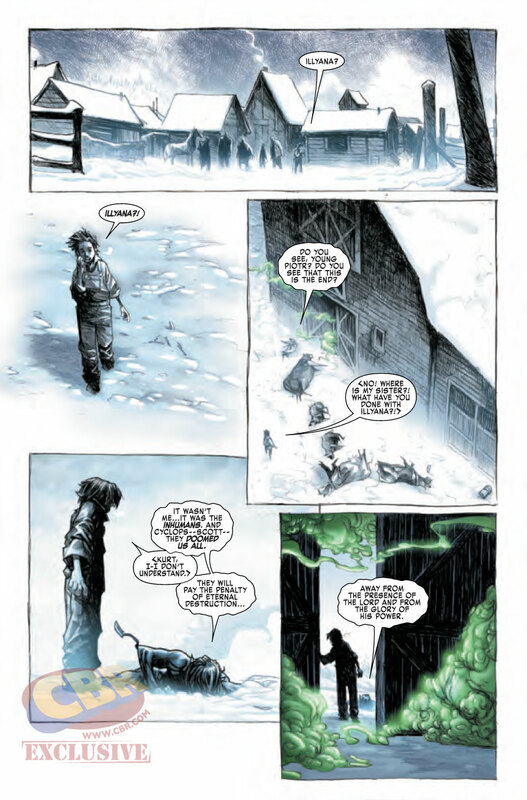 Sinister is trying to make Home Superior, even more Superior. He is currently experimenting on a purple version of Mammomax. The new Marauders start getting name checked. The old guy with the horns is Aries – which makes sense with the horns and all. Sinister points to Kurt, who has lost his mind – only speaking in bible verses or with a biblical flair. 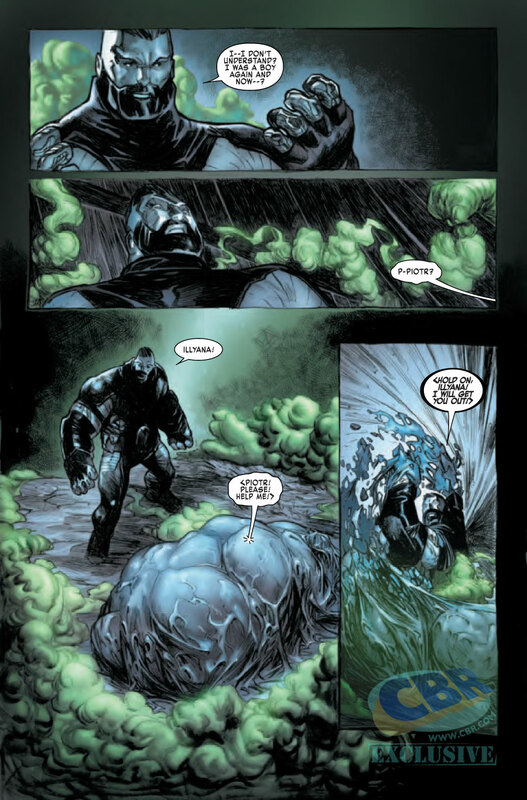 Sinister gives the elephant mutant a giant dose of Terrigen Mist. I guess everyone has access to it now. 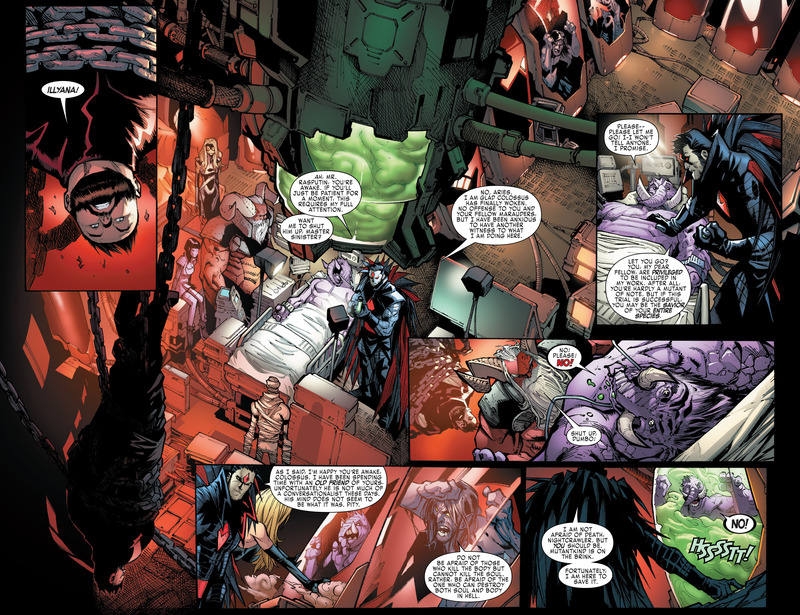 Typically, no one survives the process – mutant DNA and Inhuman DNA doesn’t mix well. Sinister hints that Magik will be experimented on next, as she is made of sterner material. X-Haven, Limbo. Storm is happy to see Old Man Logan, he’s happy to be laying into demons. Iceman saves Anole, who would like a moment to talk to Bobby, now that he has admitted to being gay. Iceman starts trying to joke around with Old Man Logan. Forge gets the shield ready to go but he wants the demons to be pushed back, so that none of them are inside the force field. Jean starts pushing the demons back, with her mind. Iceman and Old Man Logan are happy to see each other. 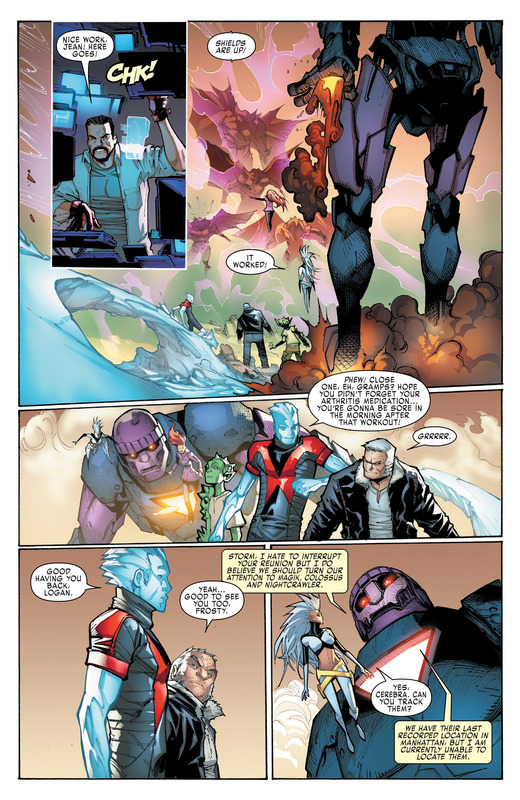 Cerebra reminds Storm that they should probably look for Illyana and Kurt. She can’t track them but Old Man Logan offers to do that. He refuses to work with Cerebra, which seems odd to me as this is the guy who killed all of the X-Men, so who is he to judge things. Forge offers up Kurt’s tail, so that Old Man Logan can get the scent. Manhattan. The X-Men teleport in and this guy immediately overreacts to their presence. He doesn’t want his children to be affected by M-Pox. Old Man Logan and Jean exchange a few words. Iceman tries to joke about them, but takes it too far. He mocks them for having a grandfather – daughter relationship but hints at the original versions chemistry. Chimera, the lady Marauder, wants to just kill Illyana. Colossus protests that plan, but he is powerless to do anything about that. Sinister has pumped Colossus with a lot of power-dampening serum. 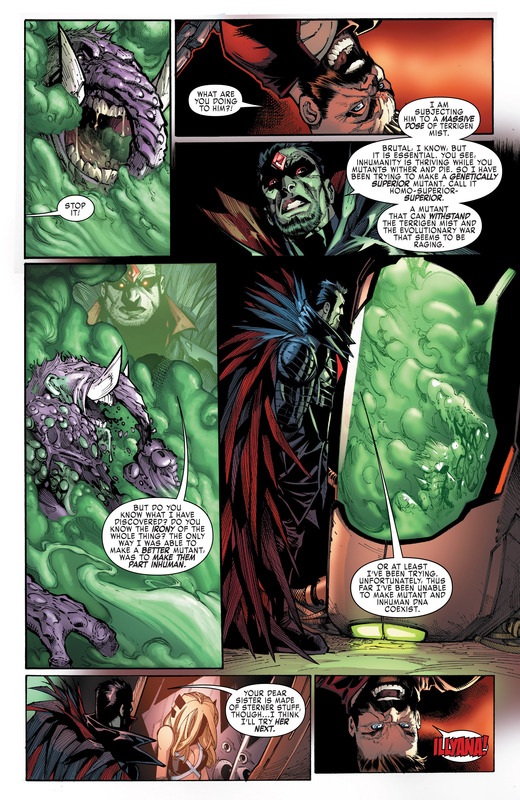 Sinister believes Illyana is a threat, due to her magic – it separates her from the others. That’s not the only thing that puts her out of everyone else’s league. Before Sinister can do anything, he gets three claws through his back – which I love how the X-Men arriving, isn’t hinted at, at all. It works so well as a next page turn. Storm announces that the team should kick some aarse, which I like this take on Storm – she’s so much more fun now. Old Man Logan skips the fight, as freeing Colossus is a higher priority. Jean takes out Chimera, who has a black hole in her head. So she’s like Xorn, I suppose. 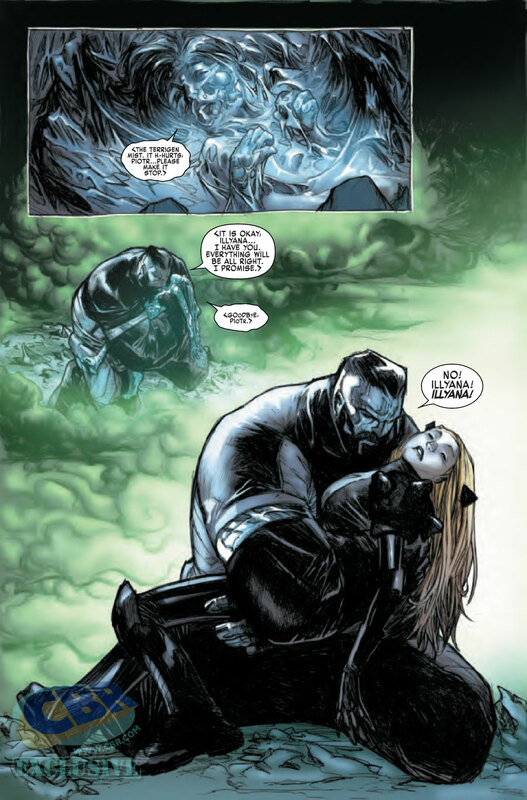 Colossus frees Illyana. She is still knocked out. 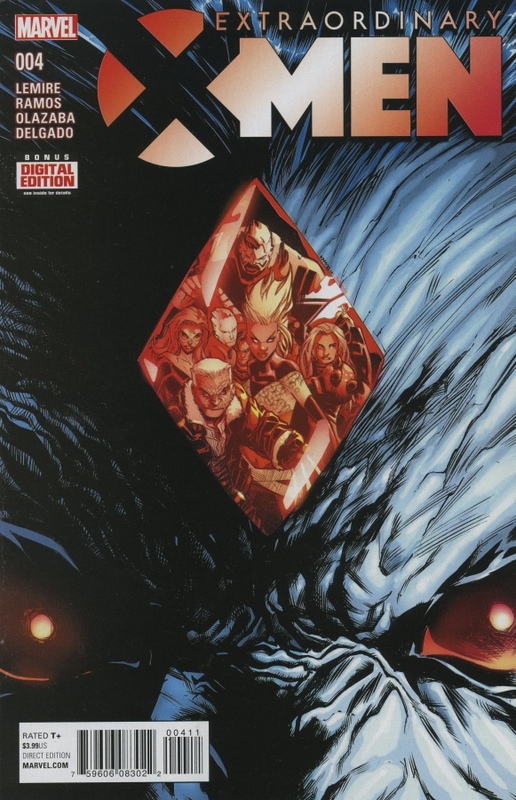 Old Man Logan and Iceman notice that Kurt is out of sorts. Sinister is able to get back to his feet, he picks up where he left off. All of his experiments have ended in failure, except for one. The issue ends with the reveal that Cyclops is alive! But with some form of Inhuman scales. I’m sure it is only a clone of Cyclops but who knows. This is the flagship title so this could be the real Cyclops. For a Sinister story, this one isn’t horrible – thus far.